'The most intriguing duel fought between women, and the only one that featured bared breasts, was between Princess Pauline Metternich and the Countess Kielmannsegg in August 1892 in Verduz, the capital of Liechstenstein. It has gone down in history as the first "emancipated duel" because all parties involved, including the principals and their seconds, were female. The fight was organised and presided over by the Baroness Lubinska, who had a degree in medicine (a rarity for a woman in those days) and was prepared to minister to any wounds incurred. 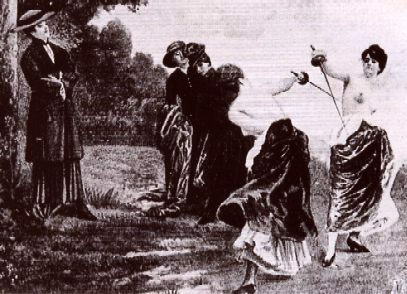 Before the proceedings began, the baroness pointed out that many insignificant injuries in duels often became septic due to strips of clothing being driven into the wound by the point of a sword. As a precaution, she prudently suggested that both parties should fight stripped of any garments above the waist. Ah, blood spilled yet again over the trivia of the well-placed! If you don't know the story, google Mattie Silks.